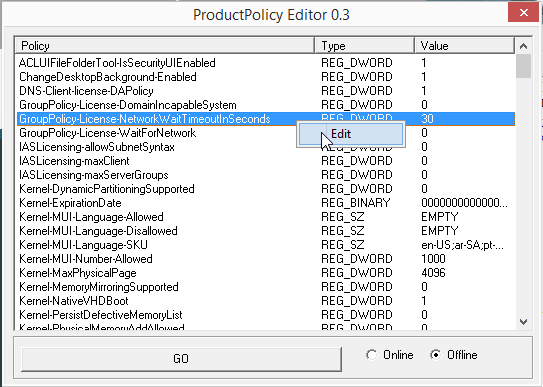 Following a discussion started here, I am releasing this Product Policy viewer. It can read both an online and offline registry. It will parse the following key : SYSTEM\CurrentControlSet\Control\ProductOptions\ProductPolicy. Check enabled/disabled features on your windows (depending on which version you have). I am asking the modos over here if adding a write feature to this tool would be considered as encouraging illegal activities. Note that I did not check yet is writing to an offline registry is actually an option. Not sure how useful this can be but...I added an "edit" feature. Only offline (system) hives are supported for now, an only dword/string type (not binary). Will probably add online hives support later as well as binary types. 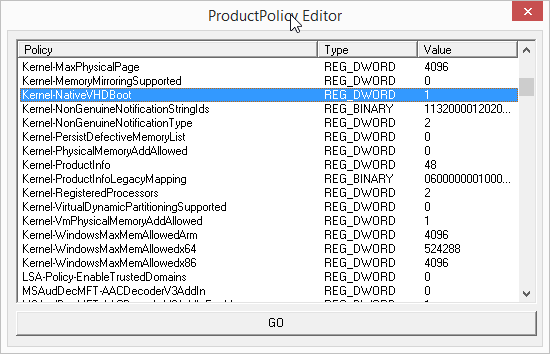 where to download productpolicy editor 0.3? Edited by ljycslg, 21 November 2015 - 02:32 AM. stupid me... had forgotten to attach the file to the post. Edit : uploaded a tool (here) to save the system registry hive to be able to perform tests with the edit feature of ProductPoplicy Editor. The product policy is changed after a reboot but it seems it reverts back to previous state after a few mns. stopping or disable the "software protection" service will prevent policies to revert back. sc stop sppsvc or sc config sppsvc start= disabled. Thanks for this tool! Great job! Do you happen to know whether there is a way to make "software protection" to recognize these changes? Perhaps there is a storage of approved settings for validation of current settings? I am not sure this is possible. I have read/seen about a tokens.dat behind the scene. Note that we are on the edge here : one is not supposed to permanently change these settings (since under license). This is purely for R&D purpose and changing these settings temporarily may lead to interesting scenarios already. Remember that the actual discussion (around native vhd boot) started here. Yes you are right, it is similar ! Did not check the full thread yet : not sure it works offline. Thanks for the excellent tool. What prevents your tool from editing an online registry hive ? The sppsvc service runs as NT AUTHORITY\NETWORK SERVICE, I am thinking if we run your tool as NT AUTHORITY\NETWORK SERVICE, it should be able to modify the online registry hive? It would be easy enough I believe (i vaguely remember that I had already initiated that piece of code). If the code is run as admin, I am not even sure I need to run under another security context. A GUI tool can be very useful when doing experiments, and in this case to "decode" the key, but if you want to change some values/keys and you already know which ones and how to change them, why wouldn't Regedit or Reg.exe do (or erwan's offline Registry thingy if the offline is needed)? The key to write/update is not straightforward and if I recall correctly you need to do some bit shifting and/or map to complex types (as opposed to simple string/word etc types). Something that a few lines of codes would handle very easily. it goes as is (rather easy actually except that you need to deal with custom types). It is a binary value. First come a header (20 bytes) then a series of values (16 bytes+sizeof(name) each). search for Kernel-NativeVHDBOOT, skip 2 bytes (word)=datatype, and there should be your value (2 bytes). I meant another thing (but I am probably too blunt or direct). Now change the specific bit (or byte or whatever) Agni is interested in. Reset the value as it was before. Can Regedit or Reg.exe change it again ? It is either yes or no, if it is yes a GUI tool makes little sense (while - a command line one would be useful - but unneeded) if it is no, then definitely the GUI tool would be needed (and still a command line version would be more useful in practice). answer is yes you can. this is how i was going to proceed as well : dump it, parses it, modify it, restore it. I also noticed that after using your tool, the size of the system.bak is less than the original system file. Does your tool do some kind of compression ? No compression but it uses a different library (still a microsoft one thus) so the size may vary. It could be that it skips the "junk" like unused entries which you may find in a windows hive. I dont think you have to be concerned by this. Thanks erwan. I have successfully used your tool to boot a Win 32 bit from a 3900 MB VHD on a computer with 8GB of RAM.I was able to modify Kernel-WindowsMaxMemAllowedx86 and Kernel-MaxPhysicalPage to 16384 (from 4096 ) , which enabled the OS to see the remaining RAM that was not used by Grub4dos to load into RAM. The other advantage of this could be that we no longer need to disable Software Protection service as this would be a RAMDISK and any changes reverted by sppsvc service to the product policy would not be persisted. ( I am yet to test and confirm this, but should work in theory). There actually a lot of windows features which you can turn on : vhdboot, supported memory, concurrent terminal services, etc ... the list is rather long. However, lets remember that this is "discussable" from a licence point of view. To get all these extra features, one should normally upgrade to a higher/more expansive windows versions. Good point about sppsvc and RAM disks ! Another trick (for non RAM disks) could be to use a logoff script to reapply what ever features you wish to play it. Actually there is nothing to "discuss", it's pretty much binary On/Off or 0/1, if you (or the Law in the country you live) believe in the validity of the Eula, this is breaking it. 1) in the case of more than 4 Gb on XP Microsoft made them available initially, then abruptly removed the possibility (without telling you) and told you that it was not possible. These are very good news. I always thought that the 4Gb limitation was hardware related.